Australia’s Geoff Drakeford has qualified as second seed for the British Amateur championship being played at Royal Troon in Scotland. Drakeford carded rounds of 67-71 to finish at 4-under-par, two strokes behind Sweden’s Daniel Jennevret, who claimed medallist honours with rounds of 71-65. 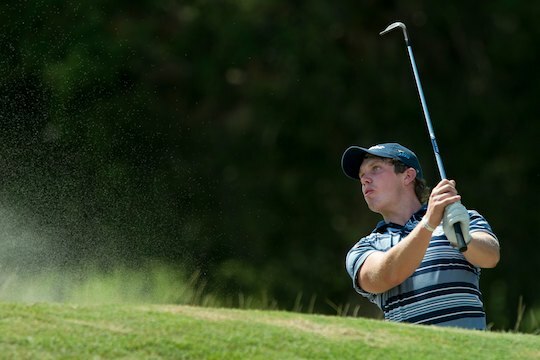 Six other Australians qualified for the championship with Nathan Holman carding solid rounds of 72-69 to secure a top-7 finish and be the next best Aussie behind Drakeford. Daniel Nisbet proved why he’s one of our hottest prospects in these championships finishing in a tie for 15th position with rounds of 69-72 to finish even par, three shots within the top-61 and ties qualification mark. Matthew Stieger rebounded with a second round of 69 after opening with a 74 to finish at 1-over-par and in a tie for 28th position alongside Daniel Bringolf. Jordan Zunic continues to play well, having made the cut in every event he has entered this season in the UK, firing rounds of 70-74 to finish at 2-over-par to guarantee his place in the match-play series, which commences on Wednesday. Todd Sinnott was another to make a second round move firing an impressive 70 after opening with a 75. Sinnott finished at 3-over-par and will meet England’s Tom Berry in the first round. Of the Australians to miss qualification, Callam O’Reilly finished at 6-over-par with rounds of 73-75, Cameron Smith finished in a tie for 136th after showing promise with an opening 70, only to dash his chances in these championships with a second round 79. Jake Higginbottom was another to struggle, firing a second round 77 after opening with a 72 to finish at 7-over-par and in a tie for 136th.